This was very special. I sat with gratitude from what I just witnessed. Roger Federer defeated rival Rafael Nadal in a five-set classic. This a day after Serena Williams made history against sister Venus. A challenge by Nadal on the final point that was called good…it was good making it game, set, match. Federer dug deeper than he has ever had to for one win. I do not enjoy the greatest of all-time argument in tennis. However in what might have been the most important tennis match in history, Federer made an emphatic case for the title of greatest male player ever. He won a heart-stopping and eye-opening Australian Open final defeating Nadal 6-4, 3-6, 6-1, 3-6, 6-3. After missing six months of tennis from July to January, the 35-year-old Federer, who hadn’t won a Grand Slam singles title since Wimbledon in 2012, improbably ran his major total to 18, four ahead of Nadal. A little breathing room for the odds of Nadal catching Federer. The fifth set left me speechless. My mom herself could not imagine it even ending. The oldest major finalist in 43 years, Federer lost control of his legendary forehand in the final two sets but rallied famously late in the fifth. He was flying around the court in the final games. “I’m out of words,” Federer said in his on-court interview, addressing Nadal. “I don’t think either one of us believed we’d be in the final here when we were at your academy five, six months ago. Here we stand in the finals. It was Nadal, 30, perhaps the most resilient and mentally tough tennis player of his or any generation, who blinked in the end. “First of all, I can say congrats to Roger and all his team,” Nadal said in his on-court interview. “Just amazing the way he’s playing after such a long time without being on the tour. For sure, you have been working hard to get that one, so very happy for you. Federer is considered one of the nicest people off the tennis court, known for personally signing autographs to fans across the globe. He becomes the fourth-oldest Grand Slam winner ever; Ken Rosewall won majors at the ages of 35, 36 and 37. Federer is also the first man in tennis history to win three majors five or more times. His trophy collection includes five Australian Opens, one French Open, seven Wimbledons and five US Opens. Nadal was the fourth top-10 player to fall to Federer in Melbourne, following No. 10 Tomas Berdych, No. 5 Kei Nishikori and No. 4 Stan Wawrinka. As recently as three months ago, this matchup didn’t seem remotely possible. 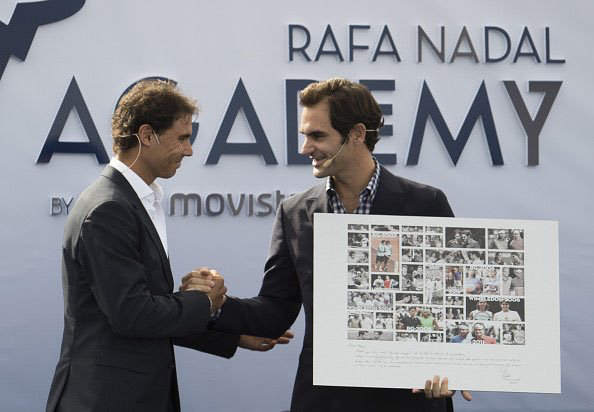 When the two men got together at the opening of Nadal’s new tennis academy in Mallorca, Spain, Federer was still troubled by a balky knee and Nadal a wrist injury. Instead of playing an exhibition, they hit a few balls with the juniors and posed for photos. Even when they arrived in Australia, they were afterthoughts, with Nadal seeded No. 9 and Federer No. 17. But when No. 1 Andy Murray and No. 2 Novak Djokovic crashed out early, they began to attract attention. It was the fourth time a Federer-Nadal Grand Slam final went to five sets, the most between any two players in the Open era. This first Grand Slam final of the year sent the tennis universe into a frenzy, and record television ratings were expected. At Melbourne Park, some courtside seats were reportedly going for $26,000. For the first time, organizers opened the second-biggest show court, Margaret Court Arena, and showed the match on the video screens. Nearly 25,000 attended the session. It was priceless again as gratitude fluttered from the heart.